"Rembrandt, the wild man, who would not hesitate for a moment before ruining his work in pursuit of a new idea." This drawing is undoubtedly a bit of a mess. 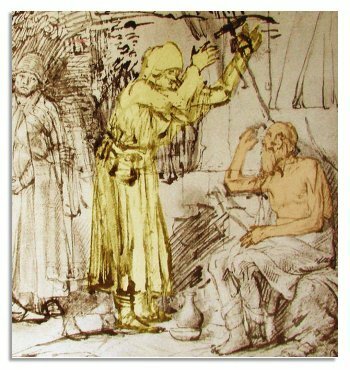 Scholars have described it as a student drawing corrected by Rembrandt. A category of little interest one would suppose. But when one comes to examine the first draft, which is drawn more delicately, one cannot but admire "the student", and be rather horrified that Rembrandt could have drawn so brutally over such a successful work. Also it is impossible to find among Rembrandt's students one so gifted. 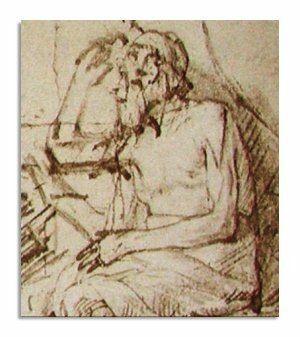 This drawing has got to be Rembrandt correcting Rembrandt. Or more accurately, Rembrandt pursuing a new idea on top of an existing drawing, albeit one of top quality in his production. 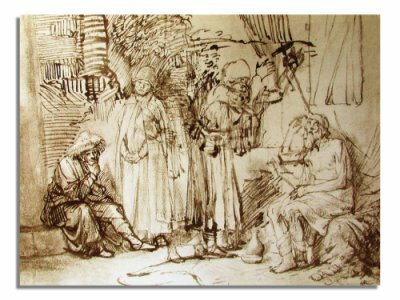 The changes do not improve it as an object of enjoyment, but the drawing tells us a great deal about Rembrandt the Artist. In the drawing we do not need X-rays to see what has happened. It is very difficult to erase completely a line drawn with ink on absorbent paper. 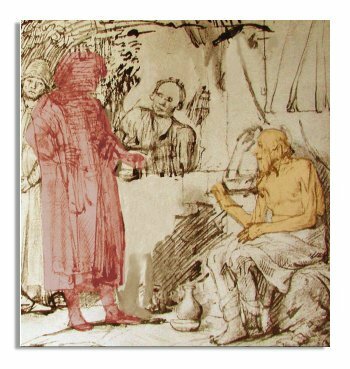 If we look carefully at the drawing of Job himself it is not difficult to see (below) that in the first draft he is arguing with his wife, who turns for support to one of the comforters, now so completely washed out and drawn over that we can no longer discern his reaction. Though by general stance of his figure (washed red) we can guess he is sympathizing not with Job, but with his wife. In the second attempt Rembrandt has changed Job who now makes a gesture of despair. His wife waves her stick in anger. I judge these two versions of Job as so superior that we cannot possibly doubt the hand of Rembrandt in the first version and we can agree with the experts that Rembrandt himself is responsible for the second. The same first rate quality can be found in the remains of the washed out comforter. The rest is average Rembrandt. None the less I would like to promote this drawing from one of periferal interest to one of the greatest possible interest to Rembrandt students. Benesch (the author of the Catalogue Raisonné) idealized Rembrandt and has led his followers into a disastrous policy of rejecting works that are not neat enough to meet their unrealistic expectations of Rembrandt's genius. We find Rembrandt's same restless and inventive spirit in the drawings, the etchings and the paintings.